The data presented here is damning on two levels. First, as a perfect visualization of the Tragedy Of The Commons, in which we don’t have the will or the wisdom to steward resources on a global scale, instead just seeking profit wherever it can be found, nevermind the fact that over time we are destroying the very stocks we seek profit from. The journal Science recently published the first comprehensive analysis of more than 10,000 fisheries — roughly 80 percent of our global fish catch. 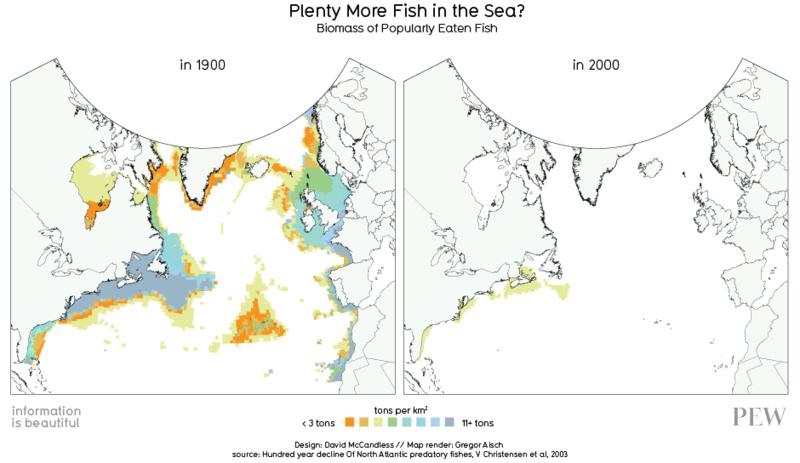 The conclusion: fish populations worldwide are swiftly declining. This global analysis paints a stark new picture of a global ocean fished to exhaustion in an increasingly hungry world. So, why are we hopeful? It’s because the analysis of global fisheries has a silver lining. We have not reached a point of no return. We have time. Solutions exist. The good news is that many large commercial fisheries are already benefiting from the improved management of the last decade. The harder problem is with smaller-scale fisheries that local communities rely on for food and income. The fact is that small-scale fishers — who fish within 10 miles of their coast — account for nearly half of the world’s global catch and employ 33 million of the world’s 36 million fishermen, while also creating jobs for 107 million people in fish processing and selling [pdf]. Mostly poor, they live mainly in areas lacking fisheries management, monitoring and enforcement. No one is in a position to formally declare their fisheries “disasters.” They must just endure their situation. Or — take control of it. 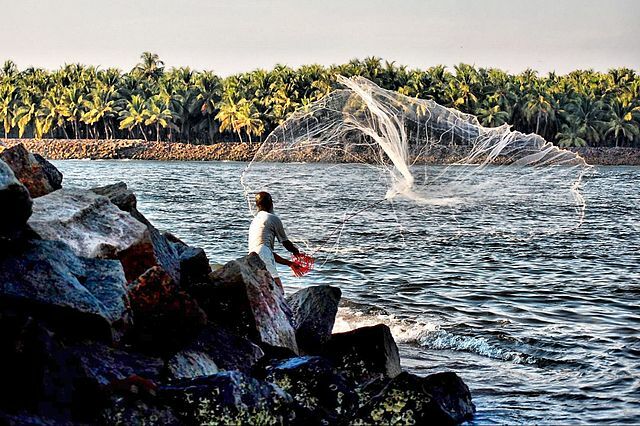 In exchange for the privilege of exclusivity, local fishermen agree to establish and protect no-take zones. Results include increased fish populations, richer marine habitats, and coastlines less vulnerable to climate change — and more food for people. Unleashing the self-interest of local fishermen to advance both conservation and economic development can create one of those rare win-win scenarios. A growing body of research shows that fish populations inside a no-take zone can more than quadruple. Fish numbers outside the reserve can double. And, exclusive access enables investment and better management, increasing the catch’s value. That feels right. No one cares more about managing stocks than the very people whose lives and livelihood depend on the stocks surviving. The challenge is that thousands of TURF zones would have to be created (and enforced) around the globe. That’s really just another way of saying that we have created a big problem so we need a dramatic solution. And I wish humanity had a better record of tackling big challenges by putting long term interests on a par with short term interests. But the basic theme of localism is a very powerful one. And there is plenty of evidence that fishing’s emphasis on industrial practices and international fleets has been an accelerating disaster. So, sure, if we are going to do anything we should go local–and encourage traditional fishing practices that don’t strip mine the seas. It would also help if the billions of people who don’t NEED to eat fish to survive would start laying off the tuna, Chilean Sea Bass, shrimp, shark fin soup, and every other fish our lust for high-end, boutique, food is destroying. Tragedy of the commons may be a true-ism for industrial fishing, but I don’t think it is true of small-scale fisheries with community embeddedness.